Sensitive skin is a common skin condition when the skin easily gets irritation and itching. For 50% of women and 38% of men in US and UK has sensitive skin. Especially, dermatologists say that sensitive skin means extremely dry skin, which is prone to the reaction of skin such as skin erosion, skin bumps, skin flushing, skin blushing, etc. In addition, allergies, skin disorders such like rosacea, eczema also can cause sensitive skin. In this article, VKool.com will show you top 17 tips on how to take care of sensitive skin naturally and effectively at home. However, the writing is for informational purpose only, you should ask your doctor before applying these skin care tips. Now keep reading it and learn how to treat the problem without using drugs. Combine honey with some yogurt. Apply the mixture on the face for 15 minutes before washing off with fresh water. You also can take some tablespoons of clay powder, some water, honey, and lemon pulp. Mix the entire ingredient together and apply the mixture on your face for 10-20 minutes before rinsing off with lukewarm water. Another great treatment for sensitive skin is milk. Milk is really safe on skin care because it rarely cause the reaction or allergies on sensitive skin. For treating sensitive skin, you should use milk every day to make a natural toner that is harmless for your skin and health. You can put some tablespoons of cold milk in a bowl. Use a cotton pad anddip it into the milk. Dab it on your face for 15-20 minutes. Grind some oatmeal and combine it with an egg yolk. Then, you apply it on your face for 15-20 minutes beforerinsing off with lukewarm water. After that, you apply a natural moisturizer as usual. Combine a tablespoon of rose clay, some tablespoons of avocado oil, some chamomileoil, and some drops of rose essential oil. Add a bit water to get a thick paste. Apply it on your face until it is dry. Chocolate is not only used to eat, but it is also used to care your sensitive skin. Combine some teaspoons of maizepowder, some tablespoons of mashed avocado, some tablespoons of honey, and for 4 tablespoons of cocoa powder. Apply the mixture on the face for 10-15 minutes. Have a ripe mango, peel, and mash it. Mix a teaspoon of mashed mango and a teaspoon of sugar. Rub the mask on the face for 15-20 minutes before rinsing with warm water. Rose water is normally used by almost of the women and it is very effective for sensitive skin. Rose water is natural and it does not cause the reaction to your skin. In addition, rose water can balance the pH level in your skin and it will manage dryness or oiliness on your skin significantly. Use a cotton pad and soak it in the rose water. Alternatively, you pour rose water a spray bottle and spray on the face. Sunlight will be harmful to your skin and health because it will make your skin drier. As the result, you should wear sunscreen frequently even in the winter. It is very necessary to wear sunscreen and protect your skin with long dresses when going out. By doing this way, you will have a good chance to avoid irritation, patches, and redness on your skin. It is highly recommended to use SPF 15 sun block whenever leaving home. Squeeze 1/2 lemon in a cup of lukewarm water. Add some honey to drink when your stomach is empty in the morning. Leave it for 30 minutes before having breakfast. Coconut oil is one of the best home remedies for taking care of your sensitive skin when it plays as a natural moisturizer. This ingredient is high in fatty acids that support your skin from dryness. Coconut oil can moisturize, nourish, and penetrate into the pores. Also, coconut oil can cure eczema, dermatitis, and psoriasis due to its antimicrobial and anti-inflammatory properties. If you want to protect your skin from sunlight, coconut oil is also a perfect treatment for this goal. · The method is to apply coconut oil on legs, arms, face, and any dry parts of the body. Massage gently and wash off in the next morning. You also can add a cup of coconut oil in hot water to take a bath every day. Green tea, with full antioxidants, is an excellent drink for people. This drink can get rid of the toxins to protect and soothe your skin perfectly. You just need to drink some cups of green tea every day to reduce aging process and decrease sun damage. Moreover, you can store green tea in the refrigerator to cleanse your face. Another option is to choose skin care products that contain green tea. How to take care of sensitive skin is a big question to many people. The simple way to improve your health and your skin is to take healthy foods every day. Eating healthy foods is not only good for health, but it is also great for your skin care. Balancing protein, fats, antioxidants, minerals, vitamins in each meal will strengthen health and avoid the irritated skin. To take care of your sensitive skin, you should increase anti-inflammatory foods such as avocados, walnuts, blueberries, sweet potatoes, spinach, salmon, tart cherries, ginger, turmeric, garlic, olive oil, etc. you can avoid some foods that can cause reactions such as cereals, beer, soy sauce, wheat bread, barley, rye, wheat flour, eggs, and so on. To enhance sensitive skin naturally and effectively, you should choose right skin care products, which significantly improve your skin. Some soap, moisturizer, or cleanser can cause your problem worse. Therefore, you should avoid skin care products that contain synthetic fragrances, coloring agents, acids, petrochemicals, sulfate, harsh exfoliants, alcohol, etc. Instead, you should opt for cosmetic products that include oats, marine plants, chamomile, aloe vera, green tea, or white tea. You also can choose petroleum-based products to take care of your sensitive skin. A necessary step on skin care is to exfoliate your skin weekly. This is a very important way to take care of every skin types, containing sensitive skin. Exfoliation will remove dead skin cells from the skin surface, renew skin cells, and improve skin texture. Exfoliating also reduces acne breakouts, blackheads and help your skin absorb and moisturizer more effectively. For taking care of your sensitive skin, you should use natural products. For example, you can mash some strawberries and mix it with oatmeal and yogurt. Apply it on the face and apply gently. Rinse off with cool water and apply natural moisturizer. A warning is that do not over-exfoliate your skin weekly because the over-exfoliating skin will dry and damage your skin surface. Cleansing your skin is necessary but you should avoid using hot water. How to take care of sensitive skin? The answer is to cleanse your skin daily without hot water, which can cause your problem more severe. Hot water will make your skin drier, so you should not have bath or cleanse your skin with hot water, even it is in the winter. 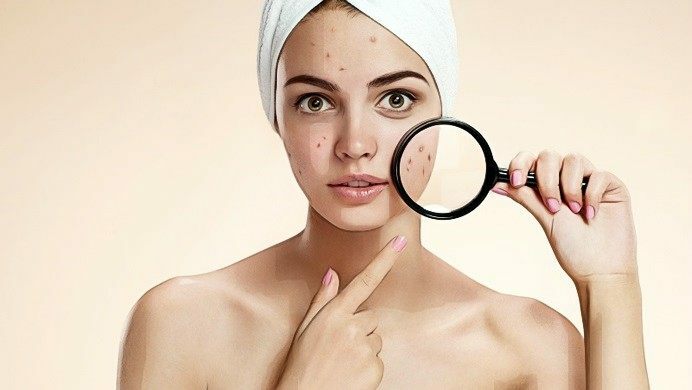 Probably you have ever heard about the defect of drinking alcohol and smoking, which not only damage every organ of the body, but it also reduces skin complexion and appearance. So the effective thing you should do is to give up smoking and reduce alcohol beverage. You will see your sensitive skin more glowing after quitting alcohol and smoking. Well, exercising will provide you a lot of benefits including skin improvement. Exercise will help you increase flexibility, endurance, energy, and boost the blood flow better, so your skin seems to be more glowing and smooth. You can go to the gym to do exercise or just stay at home to do some exercises. You can choose yoga, swimming, jogging, cycling, dancing, and other aerobic exercises. The more you do exercise, the more glowing your skin is. To know more about other health problems & effective home treatments tips, go to our main How To page. After reading the writing of top 17 at-home tips on how to take care of sensitive skin naturally, I hope that you have learned some useful treatments to improve your skin effectively at home. However, the writing is solely for the informational purpose, so you need to get advice from your doctor before applying any home skin care tip. If you have any question, please leave them below.